Badger, a small family owned company located in rural New Hampshire, has been providing uniquely formulated natural body care products since 1995. Their mission remains to create pure and highly effective quality natural products that soothe and protect the skin. These chemical and synthetic free products utilize ethically sourced ingredients, including organic plant extracts, vitamin rich oils, minerals, butters and beeswax, to formulate pure, wholesome healing products that are simply processed in small batches. Combining the finest organic ingredients with aromatherapy and time-honored traditional remedies results in formulations that respect the healing powers of nature. All products are thoroughly tested to meet rigorous safety and efficacy standards and are manufactured without fragrances, parabens, GMOs and synthetic ingredients. Badger supports sustainable organic agriculture and fair trade initiatives to protect not only the health of the environment but also the economic welfare of the farmers and their families. 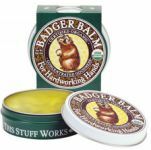 Badger Balm – Ultra-rich, ultra-moisturizing and ultra-concentrated, this USDA Certified Organic balm soothes rough, chapped, cracked or dry skin and hands. This super soothing, mildly scented salve is great for both men and women. Natural healing ingredients are gentle on problem skin yet provide effective relief for rough, weathered skin. Also available unscented. 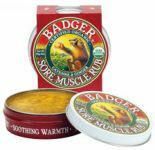 Badger Sore Muscle Rub – This USDA Certified Organic healing balm gently soothes and relaxes tense, sore muscles and stimulates circulation to warm and loosen muscles and joints before and after exercise. Natural and effective healing oils and botanicals soften and smooth skin while melting away tension. 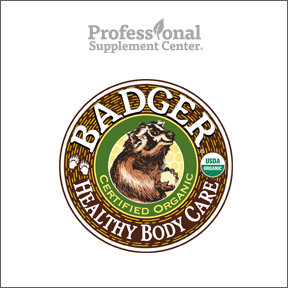 Badger Cuticle Care – This 100% Certified Organic treatment for nails and cuticles soothes, repairs and restores with soothing shea butter and nourishing extracts. Use for daily maintenance or as an intensive overnight treatment. Delightfully scented with essential oils of geranium, mandarin, lemongrass and ginger. Badger Deep Tissue Massage Oil – Massage away tension and stress while moisturizing and replenishing dry skin. Silky smooth, deeply moisturizing cold pressed oils are harmoniously blended with essential oils and botanical extracts to warm and soothe aching muscles and joints. USDA Certified Organic ingredients include jojoba oil, olive oil, arnica, calendula and essential oils of ginger, cardamom, lemongrass, rosemary, thyme and sage. To see the full line of products from Badger, please go here. This entry was posted in Home and tagged Badger, Badger Balm, Badger Cuticle Care, Badger Deep Tissue Massage Oil, Badger Sore Muscle Rub. Bookmark the permalink.